"I have own so many amps over the years and played with so many people, playing through these amps make me feel like a kid and I'm discovering new sounds and tones that I never heard before, I'm Loving Them, Thanks Egnater !!!! These amps sounds Great !!!! 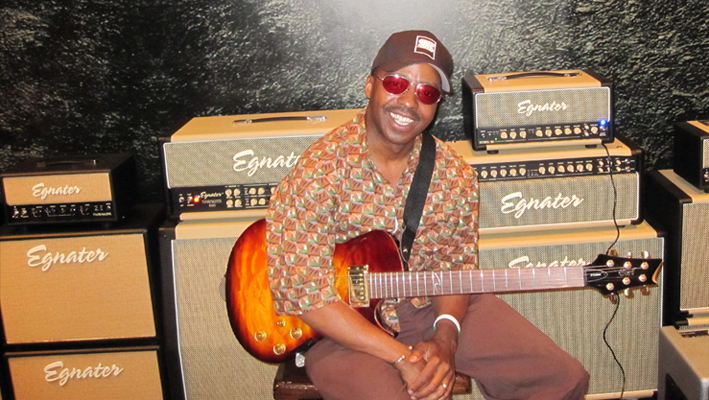 Gregory Moore, current guitarist for the legendary group Earth, Wind & Fire. He's played with the best of the best such as: Stevie Wonder, Michael Jackson, Patti La Belle, Maxwell, James Ingram, Anita Baker, Dionne Warwick, Gladys Knight, Whitney Houston, and more, however, Greg is a regular and down to earth kinda guy. Shying away from being considered as the most sought after guitar player in the United States, Greg chose to perfect his craft. "I got into this field to get away from trouble," he said with confidence. Soon after , his mom bought his first guitar, he began faithfully practicing on his own. A few years later, after perfecting his craft, Greg gained enough confidence to move to Los Angeles to further his music career and work with celebrities and musicians he'd admired and practiced to their records. He became so good that at the ripe age of 18 he was offered his first professional gig. His dreams and goals have always been to achieve great recognition, play for the best in the business, and become one of the best in his craft. He credits the "local guys in Detroit" as those who first inspired him.